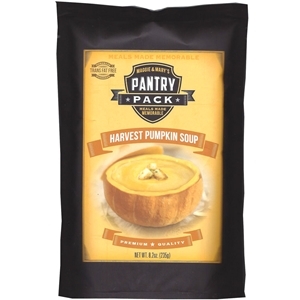 Enjoy Pantry Pack Harvest Pumpkin Soup just in time for fall or anytime of the year. Garnish with a drizzle of heavy cream, sour cream, or creme fraiche. Easy to make as well. Note: this soup was previously sold as Maggie & Mary's Creamy Pumpkin Soup. Bring 6 cups hot water to boil. Add soup mix, and blend well with whisk. Reduce heat and simmer for 30-40 minutes, or until desired consistency is achieved.